With a second disappointing season in his third year as the Vikings' head coach, rumors of Minnesota firing Leslie Frazier have begun. 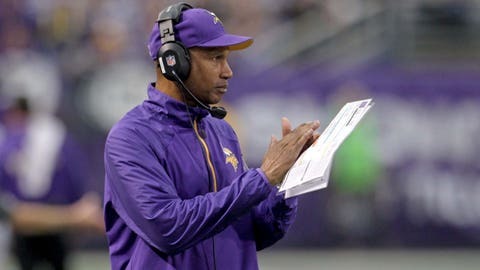 EDEN PRAIRIE, Minn. — Leslie Frazier had knocked around the coaching ranks in college and the NFL for 15 years before getting his big break with the Cincinnati Bengals in 2003. Frazier had risen from being a head coach at tiny Trinity College in Illinois — where he started the school’s football program two years after his playing career ended — to getting his first chance in the NFL as a defensive backs coach with the Philadelphia Eagles in 1999. Marvin Lewis was hired to be Cincinnati’s head coach in 2003 and hired Frazier to be the defensive coordinator. The union would only last two seasons. Frazier’s defense allowed the fifth-most yards and points in 2003 and Lewis reportedly assumed play-calling responsibilities during the 2004 season. Lewis, a defensive coordinator previously, then fired Frazier after the 2004 season. "At that time, it was best for everyone involved," Lewis recalled on a conference call this week. "I think Les was frustrated. I think everybody was. We had to change a little bit." Frazier and Lewis will meet up as head coaches for the first time Sunday with Frazier’s Minnesota Vikings (4-9-1) traveling to Cincinnati to face Lewis, who’s in his 11th year as the Bengals’ coach. After the unceremonious split nine years ago, Frazier and Lewis still keep in touch. "We get along fine," Frazier said this week. "I have a lot of respect for Marvin. That entire Bengals organization, the Browns (the team’s owners), they were terrific to me during my time there. Marvin and I see each other in the offseason. We have a good relationship. I’m always thankful for every place I’ve ever been in my career. Wherever I’ve been it’s always been a benefit so I’m thankful for my time in Cincinnati." After being fired, Frazier quickly found another job, uniting with Tony Dungy in Indianapolis, where Frazier was the defensive backs coach and helped the Colts win the Super Bowl in 2006. The experience in Indianapolis earned Frazier the defensive coordinator job in Minnesota with coach Brad Childress, who he eventually replaced. "Learned so much (in Cincinnati) that helps me out even now as a head coach," Frazier said. "Just working with the staff and some of the things you want from your staff, and just being able to communicate some of those thoughts and things you want to get accomplished. It was a great opportunity for me and as I mentioned earlier, every place I’ve been, I can look back and see the positives in each one of those situations where it’s helped me to get to where I am now. Thankful for that opportunity, thankful for things I learned, thankful for the Browns for allowing me to be there, along with Marvin." Lewis said he might have been learning those lessons as a first-time coach back in 2003-04. "I think that as the head coach, I’m ultimately responsible for everything that occurs," Lewis said. "Particularly, everybody looks at me as the defensive coach at that point. Now after 11 years, now I can be the head coach. I coach on offense, defense and special teams and frankly don’t get to coach enough. "Then it was just so many things that you’re dealing with all the time. You don’t maybe get to spend enough time in support of your coaches that way that they need to help them fix things when they’re broken, that kind of thing. I wasn’t enough backup for him." Frazier is possibly at another crossroads in his career. With a second disappointing season in his third year as the Vikings’ head coach, rumors of Minnesota firing Frazier have begun. Lewis is the NFL’s second-longest tenured coach and has the Bengals in position for the playoffs for the third time in four years. Quarterbacks are a factor: The two quarterbacks each coach has to work with certainly has played a role in where the two teams and coaches are at this season. The Vikings had the No. 12 pick in the 2011 draft and selected quarterback Christian Ponder. After taking receiver A.J. Green No. 4 overall, Cincinnati picked quarterback Andy Dalton three picks into the second round. As the two teams meet this week, Ponder’s tenure as Minnesota’s quarterback seems to have ended, with Matt Cassel starting this week and giving the Vikings’ an improved passing game. Meanwhile, Dalton is part of the Bengals’ recent success and is looking at his third playoff appearance in four seasons. Dalton started immediately and made the Pro Bowl as a rookie. Dalton visited with Minnesota before the draft and attended the team’s annual pre-draft visit, but the Vikings chose Ponder out of Florida State, considered by many as a reach. The 2011 draft featured Cam Newton as the No. 1 pick and then Jake Locker, Blaine Gabbert and Ponder in the first round. Dalton and Colin Kaepernick were early second-round choices. "I looked at him a lot, and then when he came to visit, I sat down and talked with him," Frazier said of Dalton. "I was really, really impressed with his leadership. We had another offensive lineman here at the time from the same school, and I talked with him about Andy, because I was so impressed. And then watching him on tape, he’s done a lot of things that we kind of thought he would be able to do. He’s a very good football player, a solid player." Dalton thought there was a chance he would end up in Minnesota. "I knew that they were going to be looking at a quarterback, and they decided to go with Christian instead of me," Dalton said. Dalton said he tracks how the other quarterbacks from the 2011 draft have fared, but believes he ended up in the right place. "I think it comes down to, I came into a good situation, a chance where I was going to be able to start right away, a good organization with a bunch of good guys," Dalton said. "When I first got here, nobody expected us to do anything. A lot of people expected us to not win a game. I’ve been in the playoffs every year that I’ve been here, I think I’ve come into a good situation and performing like I’m capable of doing. I think it’s getting the opportunity and taking advantage of it." Frazier said the Vikings targeted Ponder and aren’t disappointed with how the pick has turned out. "The consistency has been the major issue, from our perspective, with Christian, but we’re not displeased with the quarterback that we took and why we took him," Frazier said.